I had a great experience! Doctor Rio took his time to hear my concerns and he was very sympathetic. I’m definitelycoming back. The whole staff was very pleasant. I had a great experience! Doctor Rio took his time to hear my concerns and he was very sympathetic. I’m definitely coming back. The whole staff was very pleasant. Best doctor in Houston! Very easy to talk to, didn't rush me at all, and is able to do lab workand most things at his office,(doesn't refer you to other doctors if he can do it there). The receptionist and nurse are super nice and helpful, and they take most insurances????? Best doctor in Houston! Very easy to talk to, didn't rush me at all, and is able to do lab work and most things at his office,(doesn't refer you to otherdoctors if he can do it there). The receptionist and nurse are super nice and helpful, and they take most insurances????? Dr. Rios received his medical degree (M.D.) from Saint Louis University in 2010 with a distinction in research. He went on to complete residency training in Internal Medicine at the University of Texas Health Science Center Houston (UT Health). He then received and successfully completed an additional one year of training in Cardiovascular Medicine at UT Health. During his time at UT, he gained invaluable experience with rotations at UT MD Anderson Cancer Center, Texas Heart Institute/St Lukes Episcopal Hospital (now Baylor St Lukes), Memorial Hermann - TMC and Lyndon B Johnson Hospital. 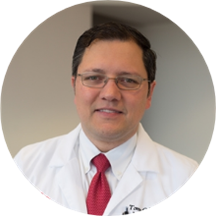 Dr. Rios' interest in research led him to participate in various research projects at UT Health and MD Anderson. In 2015, Dr. Rios started practicing as a hospitalist at Baylor St Luke's Medical Center. As a quaternary care hospital, Dr Rios gained additional experience in caring for the most critically ill patients requirng a multi-disciplinary approach to achieve the best outcomes. In 2018, frustrated with the depersonalized nature of the current healthcare system, Dr. Rios sought to change the healthcare landscape. He imagined an industry where patients came first - above money, and above politics. Thus, he created Rios Healthcare Associates, PLLC. Rios Healthcare Associates is a place where you can go for healthcare and know that your needs are the first priority. This was the nicest doctor’s office I’ve ever been to with the best service I’ve received. I was seen very quickly and professionally. I even received my lab results there in 15 minutes. They are also open late until 9pm Monday through Sunday!!! Very affordable as well! Dr. Rios is a great Doc. He took his time and made me feel he was not jumping to conclusions. He even addressed all my concerns with explanations and questions. He definitely took his time with me but when he didwalk out it didn't register to me he was going on to the next patient (not a big deal, it just wasn't clear to me yet my time with him was done haha). A great doc and will most definitely be returning again. Great doctor was very patient in explaining things. Dr Rios is kind attentive and knowledgeable, I would recommend him to anyone! Dr Rios is very nice and is a great doctor. Please go see him if you need a doctor. You won’t regret it. I went to Dr.Rios for my annual check up. Dr.Rios is GREAT at answering and explaining answers to questions. Super easy to book and his office has very convenient hours and open all weekend. Would recommend him to family and friends. It was amazing! I couldn’t believe how late this office was open and how friendly everyone was. He was very thorough and made sure all of my questions were answered. Definitely recommend! Dr. Rios was professional and thorough. Very pleasant. Highly recommend him. Very detailed and personable doctor. He listened and asked appropriate questions. Overall excellent experience. The Dr is personable and easy to talk to. Appointment was on time, and the staff are extremely friendly and helpful. I will be going back.